What will be trending for Christmas decorations during 2018? Well we could steal the phrase from a spring wedding and say something old and something new, or in the case of Christmas something vintage and something recycled too. One of the main ingredients this year is to introduce the spirit of Christmas past so have a rummage in your parents or grandparents’ loft – you never know what forgotten treasures are hidden. If they don’t match the style of your Christmas tree, you could always find a unique place for them. A glass vase with a few snippings from your tree makes a beautiful display for a windowsill or sideboard. Colour is always the first place to start, here are a few tips for different exquisite colour combinations. This year’s fashionable colours are varying within the range of purple, blue and grey. To complete the colour combination why not experiment with various metals? The addition of copper, brass and platinum will give it a bright feel. The mixing of different metal hues – gold, silver and brass gives a very contemporary appearance to the décor and the way the light plays on metals adds a mesmerising depth. Add candles and twinkling lights, and warmth will be spread through the season. Scents that are evocative of yuletide will add to the whole ambience and make the spirit of the season even cosier, think of a roaring fire with the added scent of cinnamon and pine. If you want to stay with a more classic Christmas palate, red and gold is the go-to combination. Add small details of white to balance the energy and majesty of the red and gold combo. The addition of different textiles also makes the composition more tactile, something as simple and delicate as tiny ribbons on the Christmas tree would be just perfect. How to be stylish and elegant when the Christmas decoration frenzy hits? Well just remember that less is more. A simple clear-glass vase with a few casually arranged branches will be the perfect background for your Christmas candles. Try not to over complicate things as very often a beautiful tree with simple lights and a few baubles will be as welcoming as any. Combining natural materials for a country chic look is another classic combination. Using Christmas tree branches as inspiration add brown and green elements, textiles and paper to give a natural and homely feel to your house at Christmas. Using an abundance of candles, in different shapes, sizes and colours instead of electric lights will add a natural depth and warmth. 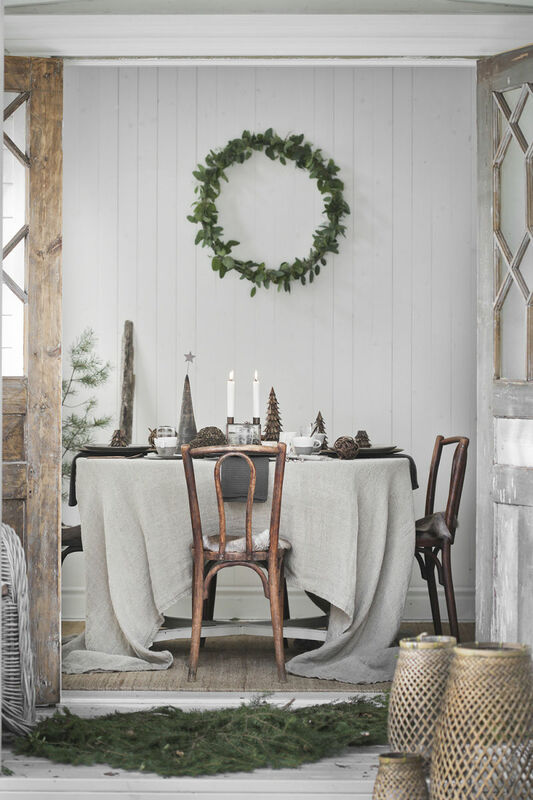 Green branches, wreaths or garlands made from natural elements to decorate tables, doors and walls provide a true feeling of a Christmas country style. Adding a feeling of Nordic style can continue this country theme with a more bohemian spirit, as using more usual materials such as straw, wool, rattan and feathers will keep it in tune with the natural simplicity of the look. Abandoning the traditional Christmas tree look for many of us is a no-no, but with lots of creative alternatives it is a growing trend. There is a bounty of beautiful solutions that allow you to indulge your artistic side. Branches can be arranged in all manner of designs and receptacles to create the visual impact of a Christmas tree. Whether you want glamour or simplicity you can combine wood, glass and metal in simple shapes to create your own expression of the traditional Christmas tree. Embrace your inner artist and do Christmas in your own signature style. No matter how you celebrate your Christmas, enjoy quality time with loved ones, relax and indulge over the Christmas period. Watch out on our Oakley Facebook page for our annual Christmas competition and be in for a chance to win some goodies.